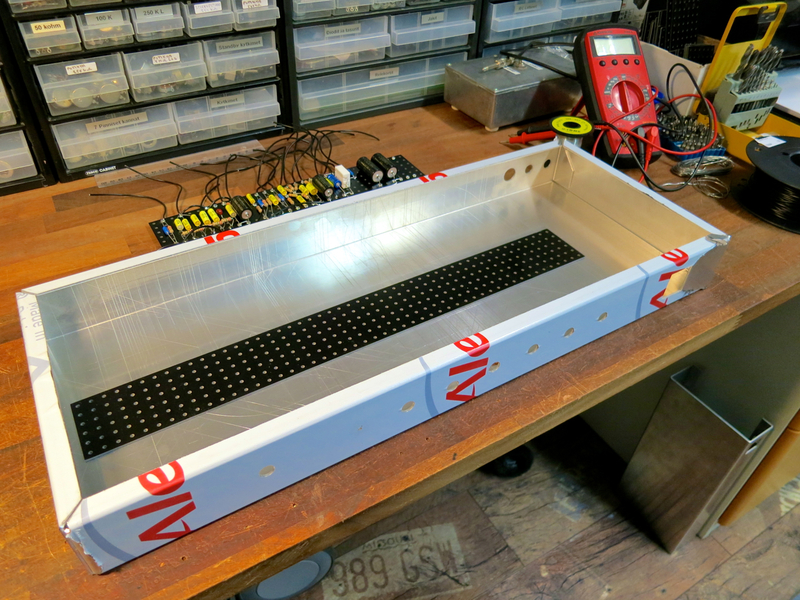 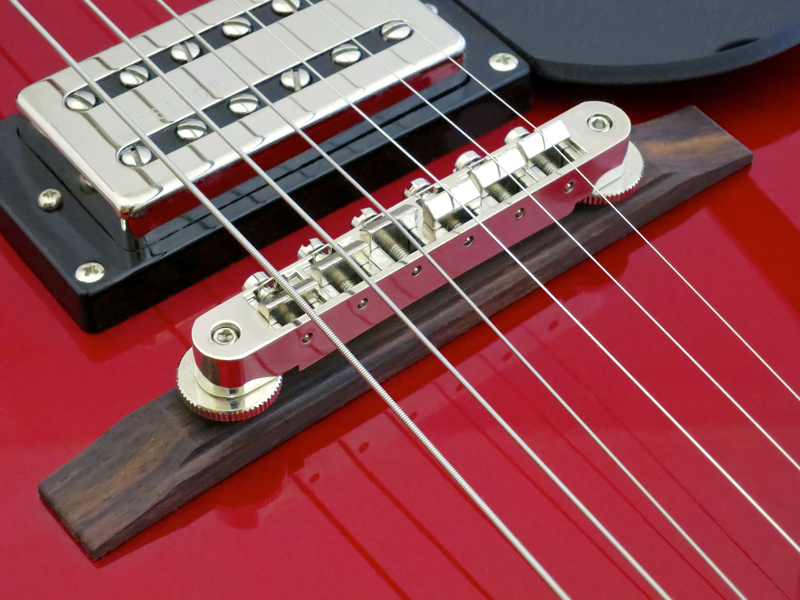 This Streamliner’s Adjusto-matic bridge may seem to be held in place simply by string pressure, but there’s more to the bridge than meets the eye. 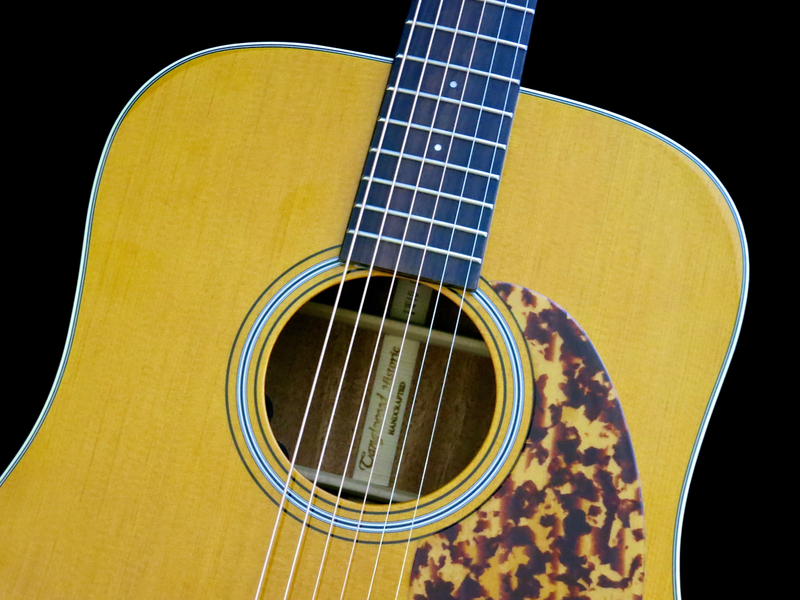 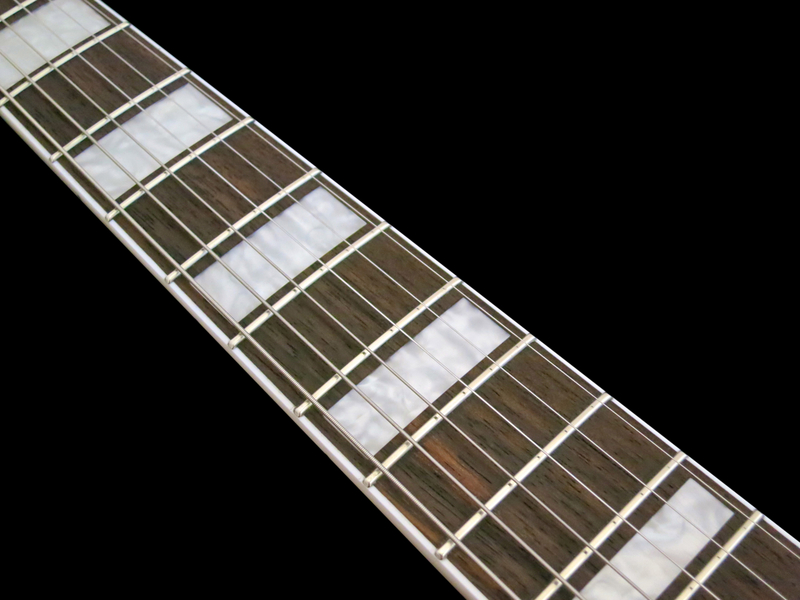 The rosewood base is ”secured”, which means reverse pinned. 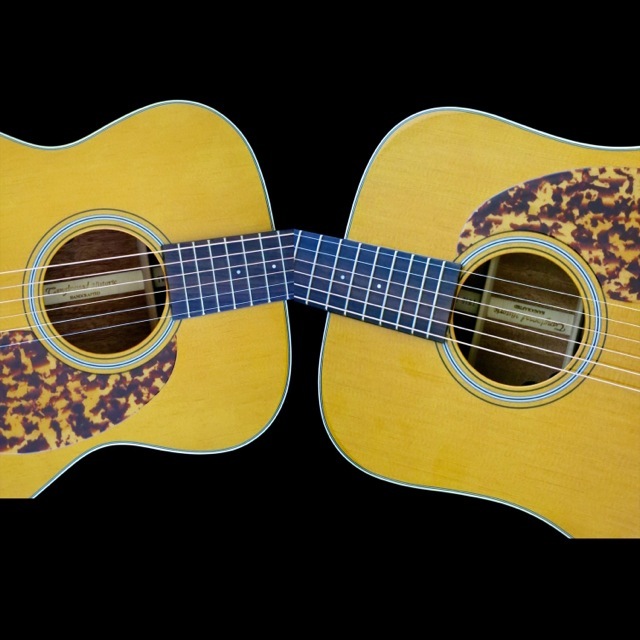 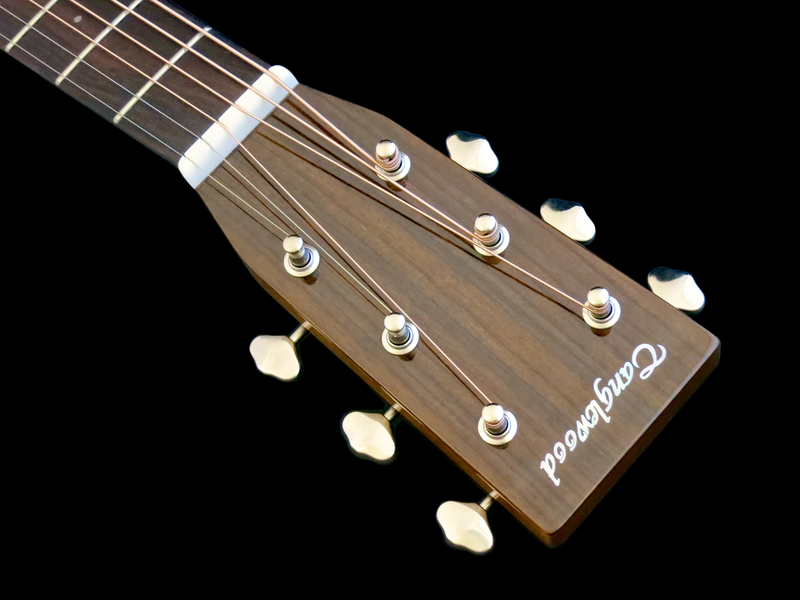 The bridge posts continue all the way through the rosewood base and into two holes in the guitar’s top, which keeps the whole bridge in the correct place. 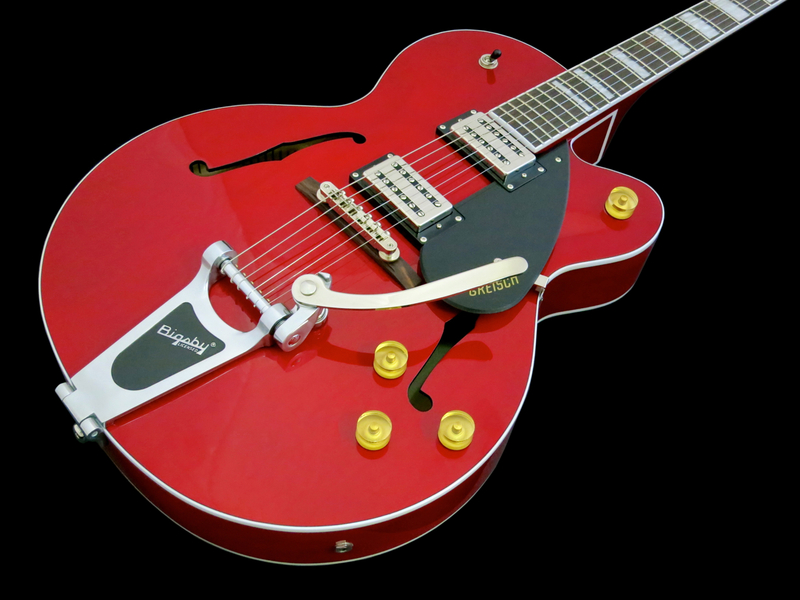 Depending on the ”era”, or an artists wishes, a Pro Series Model G6120 will either come with a pair of DeArmond single coils, Gretsch’s own Filter’Tron humbuckers or similar TV Jones pickups. 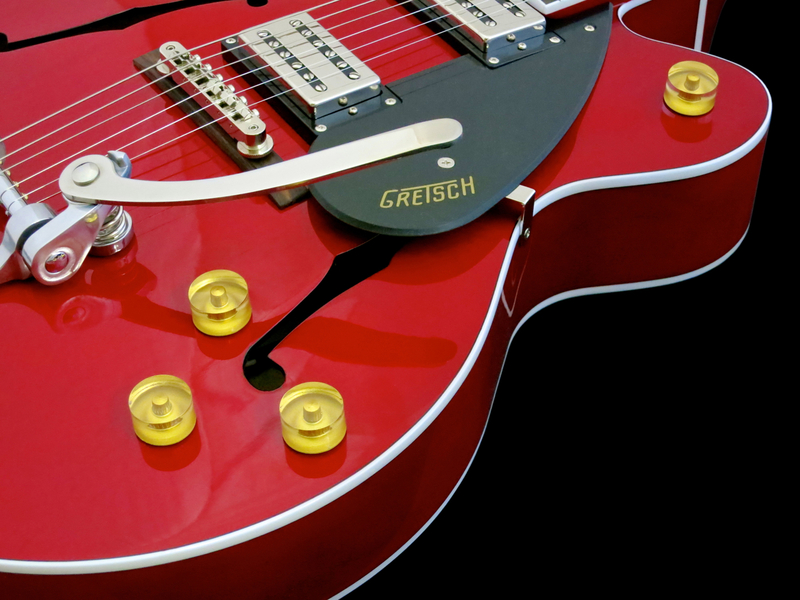 Recent Electromatic G5420’s are now equipped with Gretsch’s new Black Top Filter’Trons, which are licensed Far Eastern copies of the original pickups. 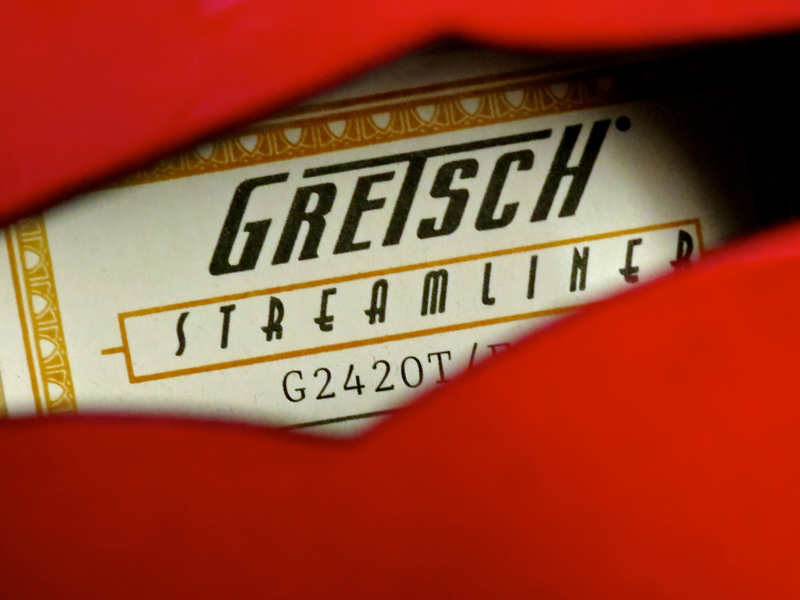 All new Streamliners sport a pair of Broad’Tron pickups. 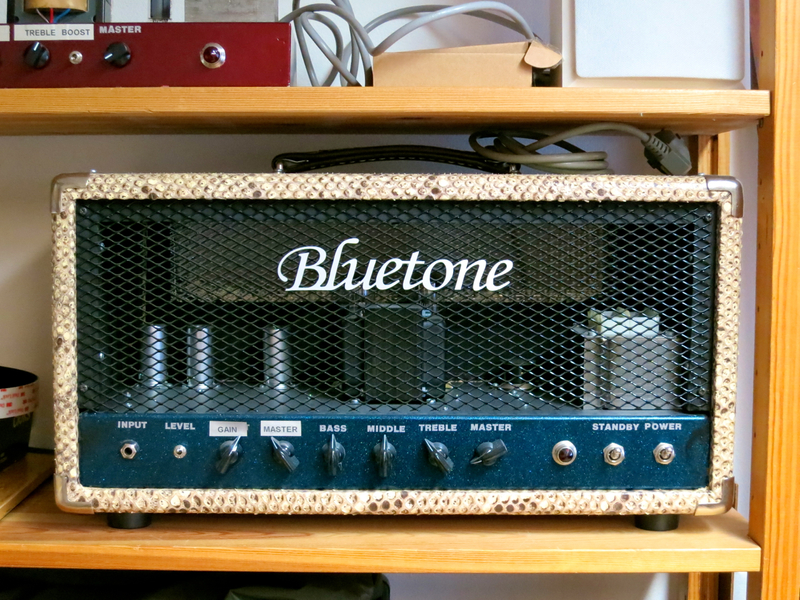 Broad’Trons are full-sized humbuckers designed to offer a tone somewhere in-between the twang and bite of Filter’Trons and the lush warmth of PAF-style ’buckers. 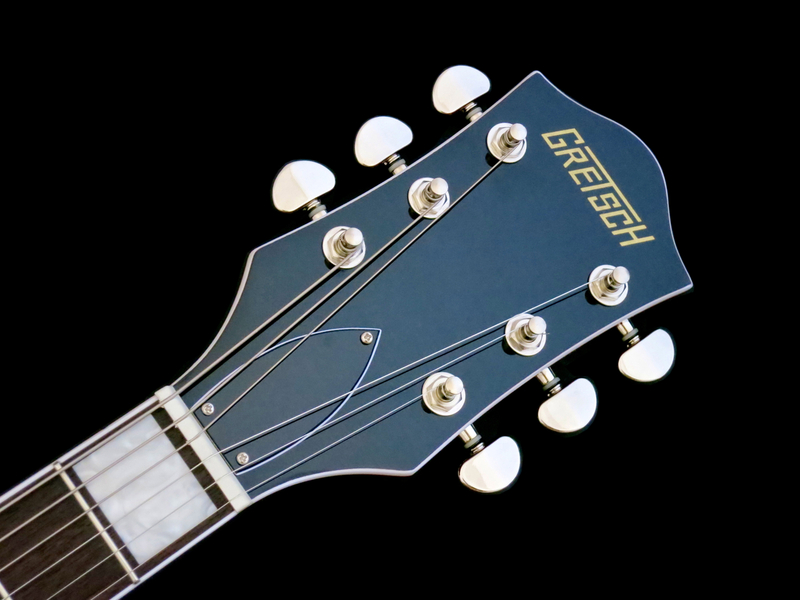 Let me start this section by stressing how well-made this budget-Gretsch really is! 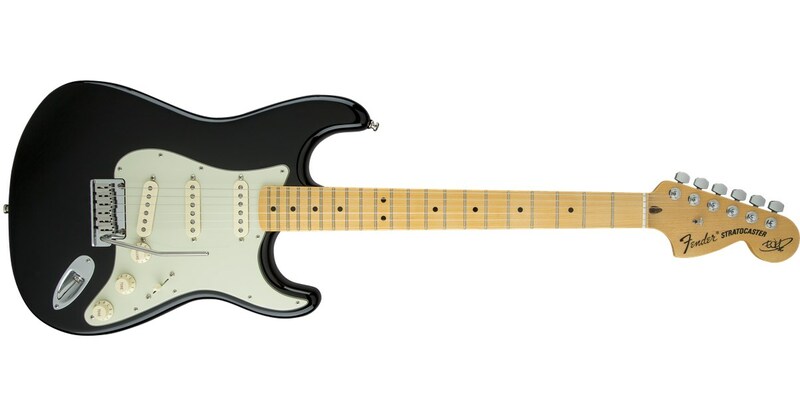 The review sample wasn’t a ”review instrument”, breathed on by distributors Fender Scandinavia, instead I took the guitar straight off the wall at a local music shop (DLX Music). 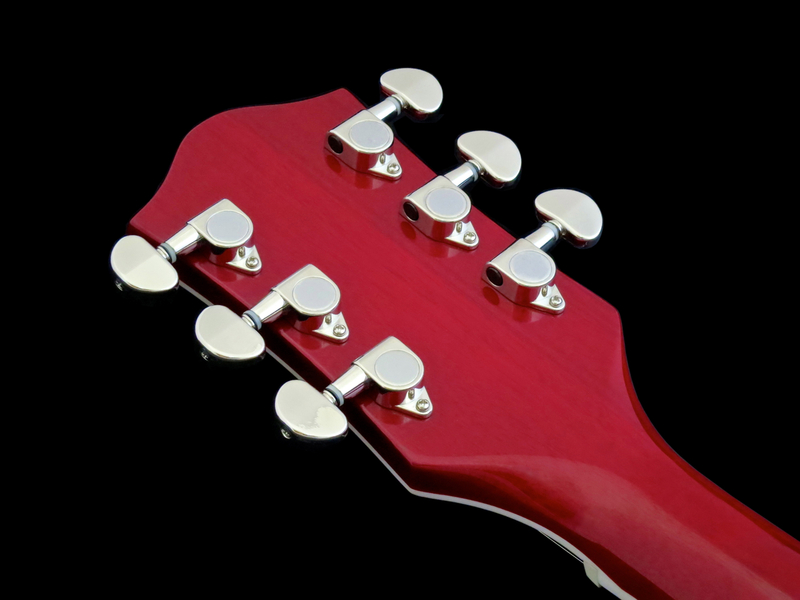 Officially Gretsch call this neck profile a ”Thin U”, but I would describe it as a very comfy D shape with a slightly flattened back. 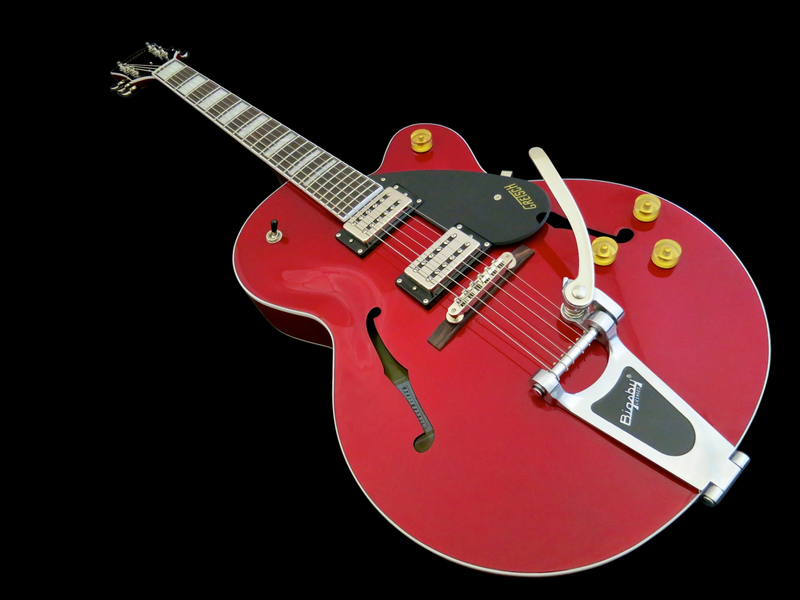 The Bigsby B60 is buttery and doesn’t throw the Hollow Body out of tune too much, if used sensibly (a word of advice: if you’re very sensitive when it comes tuning stability, a Bigsby probably isn’t right for you). 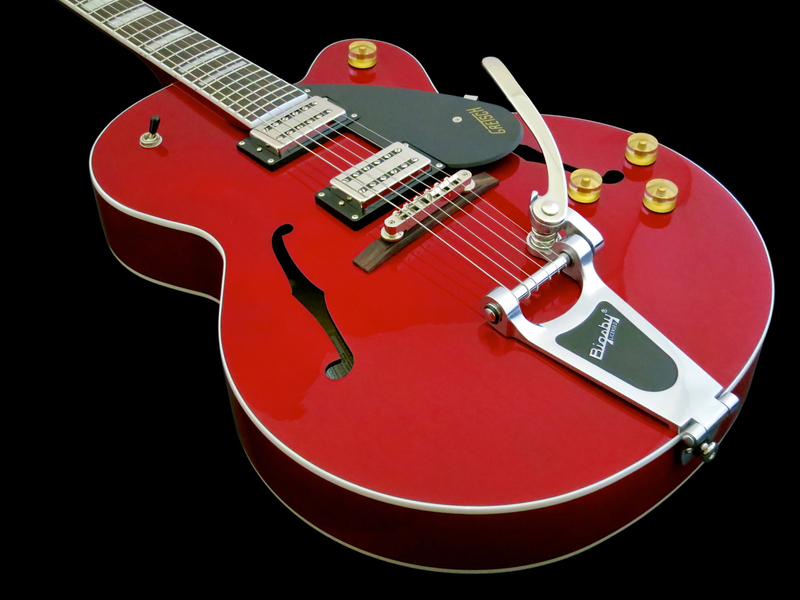 Because a Bigsby B6/B60 makes do without the additional roller of other Bigsby models, this vibrato is more sensitive and immediate in use (which is a good thing in my view). 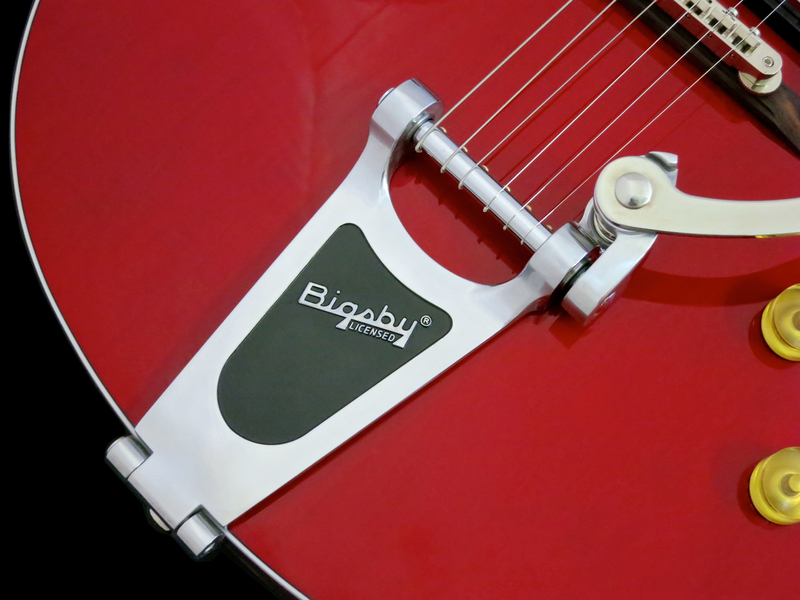 You get the all the Bigsby shine and shimmer with less ”work”. 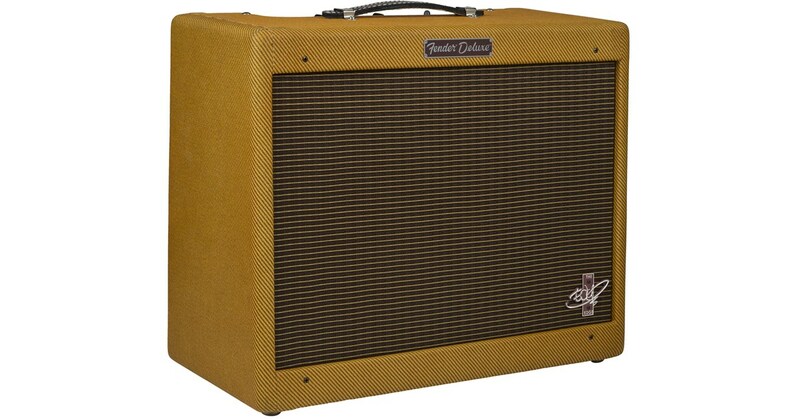 You should be aware, though, that high gain settings and/or very high volume levels will result in howling feedback sooner or later. 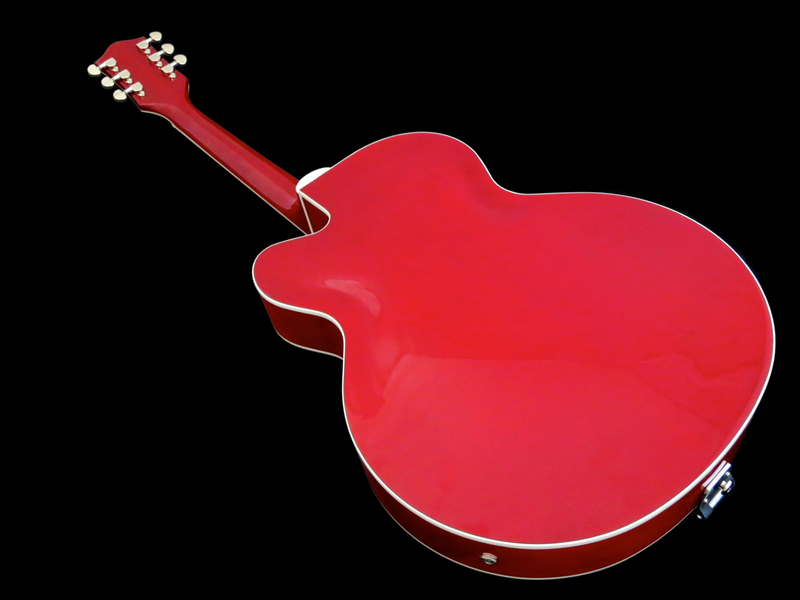 This isn’t really a fault, but rather a normal feature of this type of instrument, and the Streamliner Hollow Body isn’t any more ”problematic” than other guitars of this type. 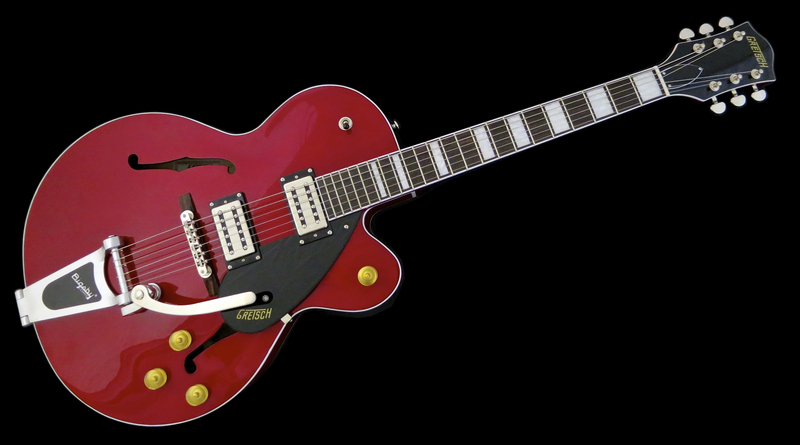 In my opinion the Gretsch Streamliner G2420T Hollow Body is one of the best full-size archtops in this price range – possibly even the best! 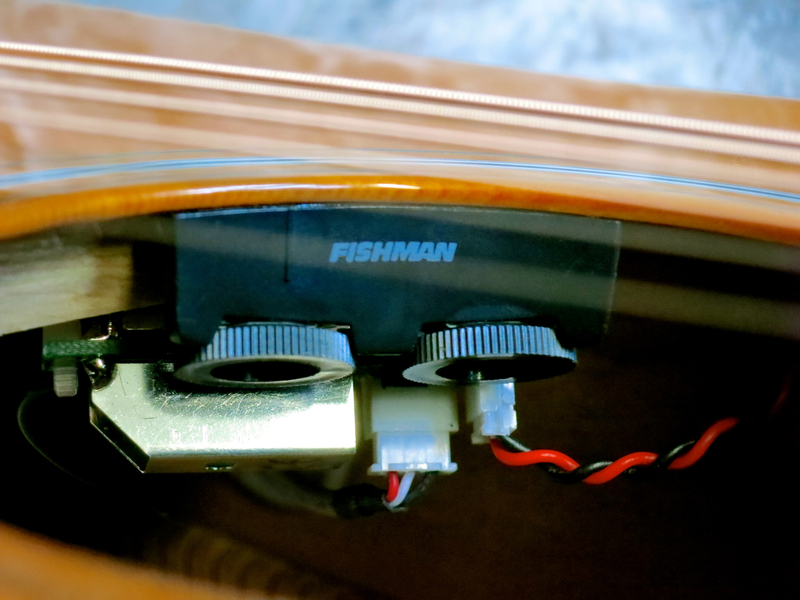 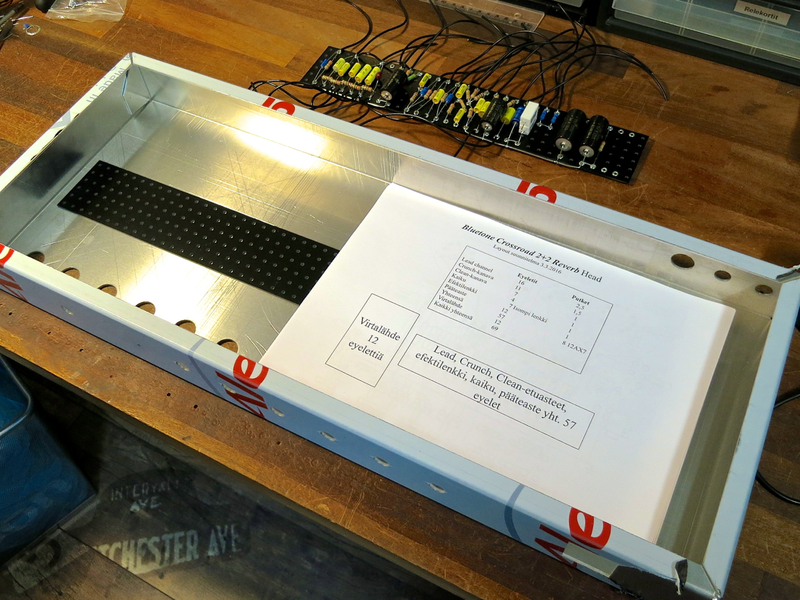 This is a surprisingly well-made instrument that punches far above its ”weight”. 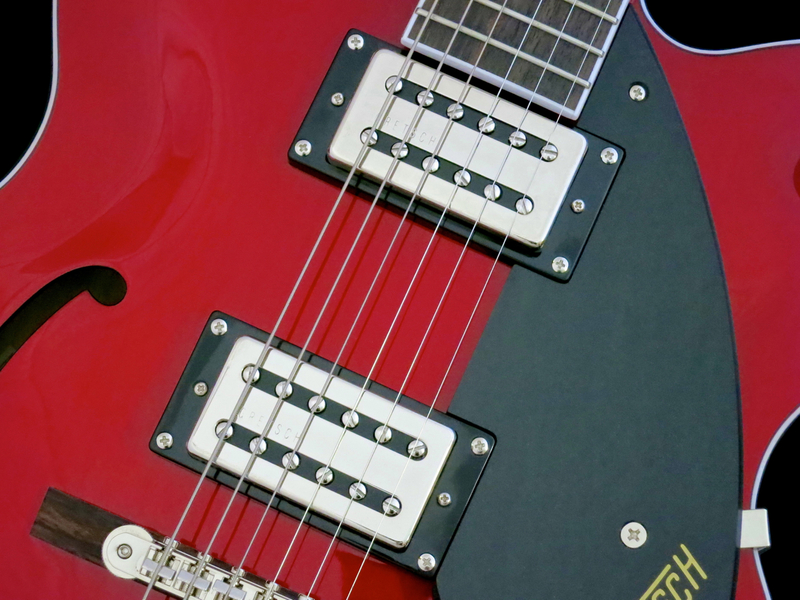 If you’re looking for the ”genuine Gretsch Sound”, warts-and-all, I would point you to the (much pricier) Electromatic Series and its Filter’Tron pickups. 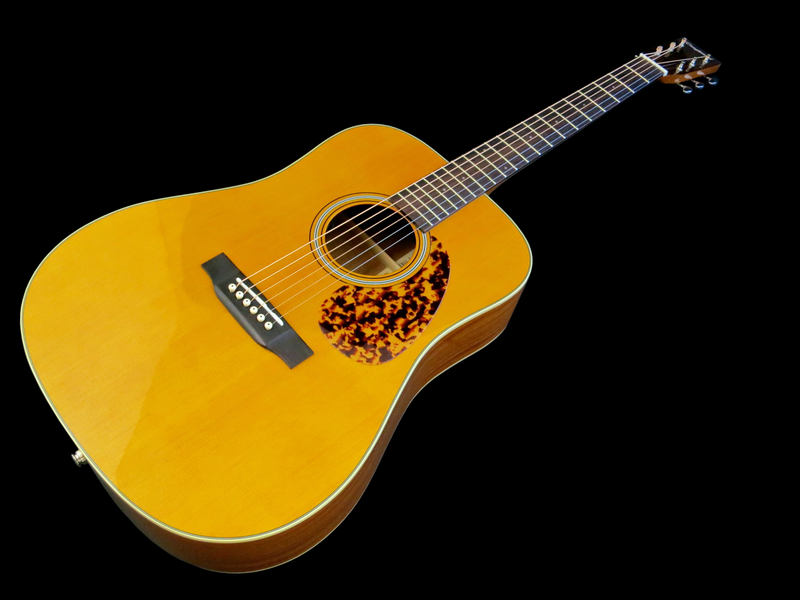 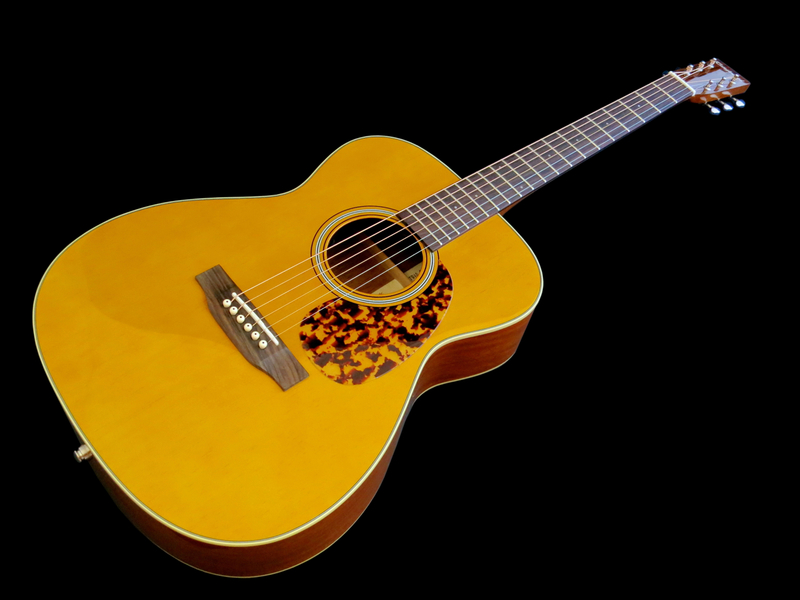 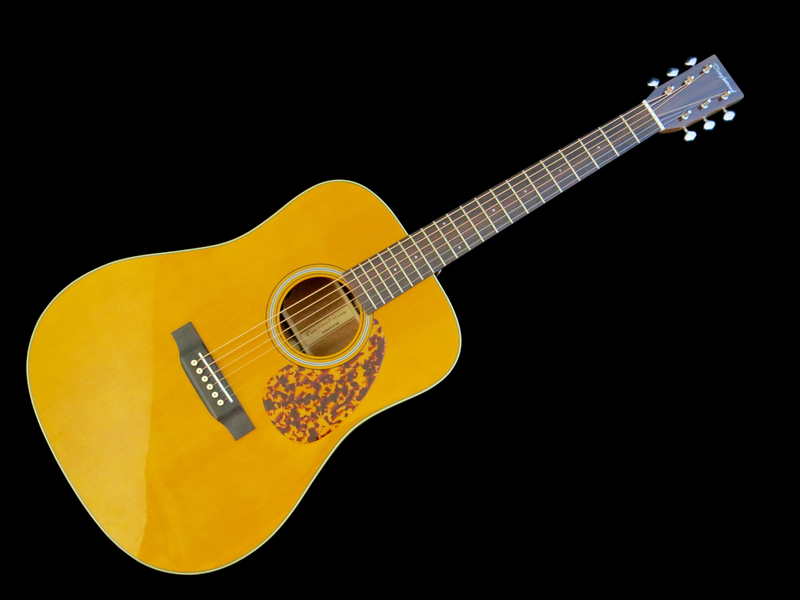 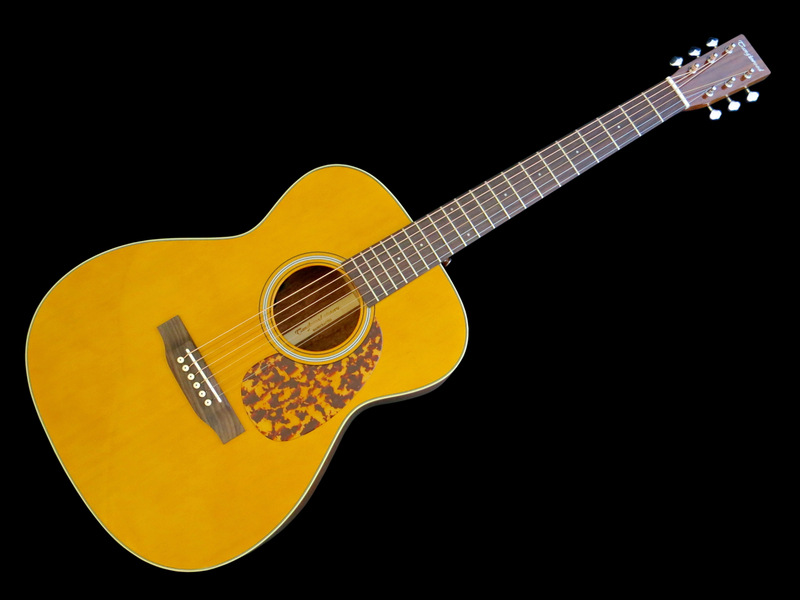 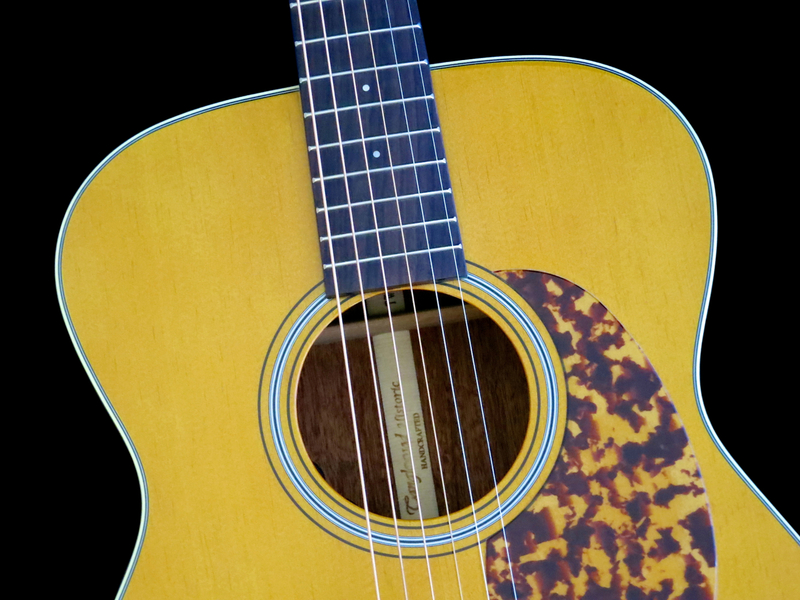 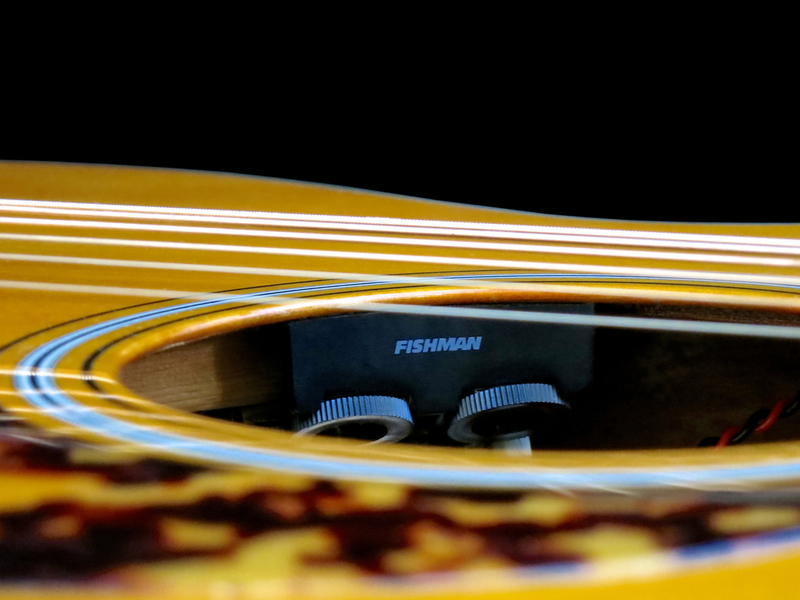 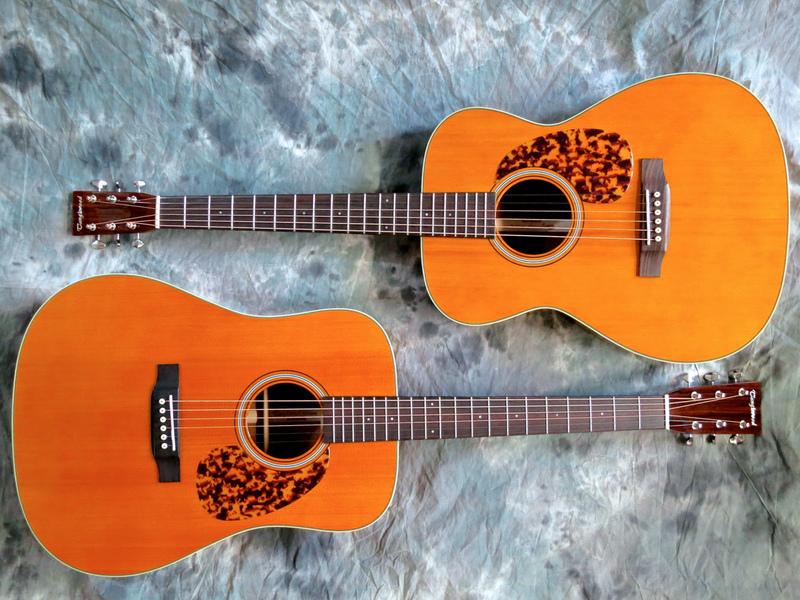 A very warm ”thank you” to the guys at DLX Music Helsinki for supplying the review guitar!